Screenwest is calling for content submissions from WA creators to display on Yagan Square Digital Tower. The partnership with Yagan Square provides the unique opportunity for WA creators to screen their work to approximately 60,000 people per day. The full technical and stylistic guidelines are available to download on the Yagan Square Digital Tower Page of the Screenwest website. Yagan Square Digital Tower. Artwork by Mel McVee. Creators whose content is selected will then collaborate with Screenwest Content Programmer/Producer Alana Swift and enter into an agreement to display their work on the Yagan Square Digital Tower. 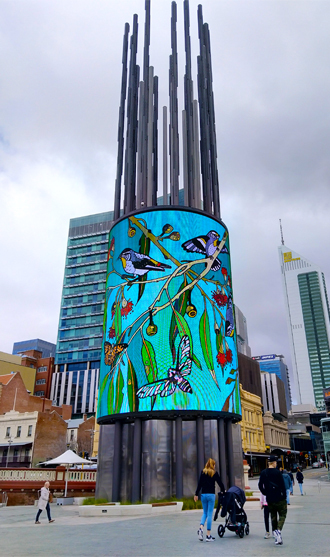 In return for providing Yagan Square with a 12-month non-exclusive license to display your work on the Digital Tower, creators are able to promote their work, branding, logo and web information on a massive scale. “The Yagan Square Digital Tower is a unique screen in the heart of Perth that offers WA creatives a fantastic space to showcase their content to the public,” said Screenwest Interim CEO Willie Rowe. The size of the digital tower means that what seems to be a moderate pace on a smaller screen, will track much more quickly across the tower and become disorientating. High speed movement (including quick tilts, pans and cuts) is jarring on the Digital Tower. Slow moving content with gradual transitions are most effective on the Digital Tower. Graphical content should have clean blacks, clean edges, simpler colours, whereas photo real content should stay away from pure black and be corrected for the Digital Tower’s cool colour bias. Dark images are not visible during the day in direct sunlight. The Digital Tower is a unique circular screen at the heart of Yagan Square. The tower is owned by the Metropolitan Redevelopment Authority with the content managed by Screenwest. On the giant screen, you can find anything from abstract graphics, to visual artworks, live-streamed events and community pieces.